Pharmacy – are there jobs out there for pharmacists? Okay, strap yourselves in!! This article is going to go into quite a bit of detail about some of the driving forces behind the labour market in pharmacy in Australia…. 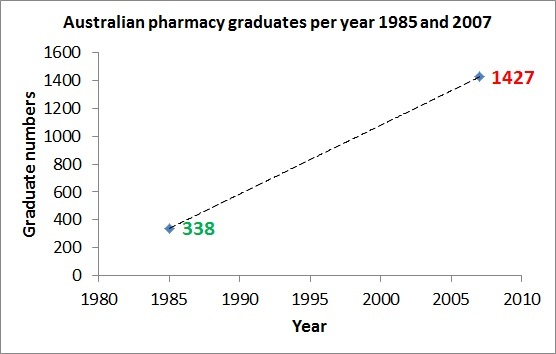 In Australia in 1985 there were 338 pharmacy graduates, and in 2007 there were 1,427. In 2002, there were only 6 schools of pharmacy in Australia, and by 2012 this had grown to 19. That is, there was a tripling of the number of pharmacy courses in a short space of time. The overall number of employed pharmacists rose from 13,834 to 14,747 between 1996 and 1999. In 2003, the Australian Institute of Health and Welfare was predicting a shortage of pharmacists in Australia to continue beyond 2010. By September 2011, health recruiters were saying that there was an oversupply of pharmacists in Australia. As at March 2013, there were 27,226 registered pharmacists in Australia. Looking at the Pharmacy Board of Australia’s statistics, 50.21% of these pharmacists are currently aged 35 years or under. 3. How have the numbers been distorted or misinterpreted? In 2010, stakeholders in the profession had differing views on the supply of pharmacists. There was even disagreement within a key organisation, the Pharmacy Guild of Australia. In August 2010 at the Pharmacy Guild of Australia’s Workforce Symposium delegates were told that there was not an oversupply of pharmacists. In September 2010, New South Wales Pharmacy Guild president broke rank and said that at the time, pharmacy owners were saying that they’d never had so many pharmacists seeking jobs. Graduate Careers Australia releases figures on the percentage of university graduates who are in full time employment around 4 months after the completion of their qualifications. While this is an accurate guide for many professions, the pathway to becoming a registered pharmacist then requires a supervised pre-registration or intern year. 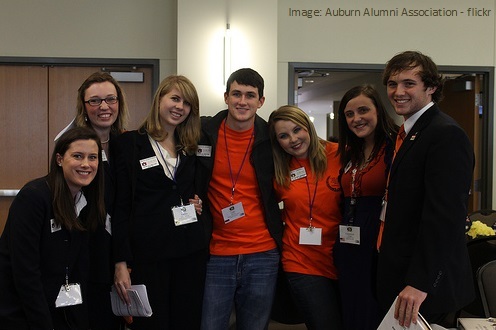 In December 2012, GradStats data showed that 98.1% of pharmacy graduates gained full time employment. However, as GradStats points out on page 5 of their document, 98.1% of pharmacy graduates continued on to their pre-registration year, which is of course different to being employed in a full-time job. The SOL is a list of occupations for which Australia is currently accepting skilled immigrants, thereby increasing the number of people employed in a particular profession to address workforce shortages. Pharmacy was removed from the SOL in 2010, but reinstated in 2011. In January 2012, the Pharmaceutical Society of Australia put forward a submission to Skills Australia saying that it could not support the retention of the professions of hospital and retail pharmacy on the SOL. By March 2012, three of the other major stakeholders in the industry, The Pharmacy Guild of Australia, the National Australian Pharmacy Students’ Association and the Society of Hospital Pharmacists of Australia agreed that pharmacy should be removed from the SOL. However, pharmacy remained on the SOL in 2012. It will be removed from the SOL in July 2013. 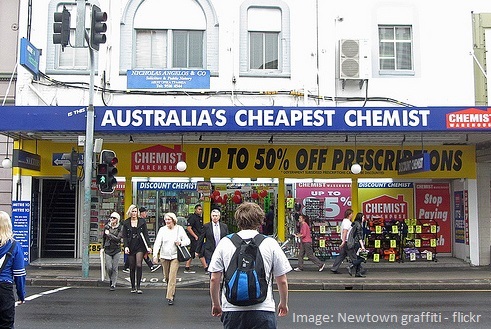 Pharmacy is a highly regulated industry, and this includes rules about the number of community pharmacies (shop fronts like Amcal, Terry White or Chemist Warehouse) that are allowed in Australia. In 1990 the national number of pharmacies was reduced from around 5,600 to around 5,000 and it has remained at the lower level since. If you do the sums quickly, you can see that if there are 27,226 registered pharmacists and 5,000 community pharmacies, that is 5.4 pharmacists per pharmacy. It is then obvious that some pharmacists will need to find employment elsewhere!! So what can pharmacy graduates expect? The cover story of Australian Pharmacist magazine in November 2011 was called “Pharmacist frontiers – unlocking career opportunities beyond the dispensary.” The article talked about two different perspectives on the jobs market in pharmacy – one being that there is an oversupply of pharmacists and the other that there is a maldistribution (i.e. an oversupply in cities and an undersupply in regional and rural areas). It is worth noting that there are still opportunities available to work in community pharmacies outside capital cities. In December 2012 national president of the Pharmaceutical Society of Australia Grant Kardachi talked about the need for the profession to move away from a medication dispensing-centric model to one which is not so reliant on this traditional approach. He mentioned that the pharmacy needs to look to professional services as a new base for its operations, and that the profession needs to adapt to survive. That is, the primary mission needs to shift from supplying medicines to helping people make the best use of medicines, thereby providing professional services in addition to dispensing medications. It is worth noting that a number of the examples of non-traditional roles mentioned in the list above do not involve dispensing a medication. In January 2013, we interviewed 2011 Pharmaceutical Society of Australia’s Australian Young Pharmacist of the Year Christopher Freeman (see bottom of page on link). He talked about the fact that because there are more pharmacists in Australia, this means that pharmacists may need to be prepared to create their own job. An example of this may be performing Home Medicines Reviews in patient’s homes, but being based in a general practice clinic. It is worth noting that elsewhere in our interview material, Chris mentions that it can be worth having experience in pharmacy prior to doing HMRs as often the cases will be complex. In March 2013 the Pharmaceutical Society of Australia’s national president Grant Kardachi was of the opinion that because community pharmacy remains the chosen field for most young pharmacists, it is therefore the most competitive in terms of finding employment. He said that young graduates should look at what other skills they can bring to the pharmacy, and that in particular, extra qualifications in business management can be a huge asset as an employer may be looking for someone who can help to manage the pharmacy. Congratulations on making it to the end of this article!! It was a long one!! Hopefully is has given you the information you were looking for with respect to the pharmacy workforce in Australia. Is pharmacy facing its Kodak moment?